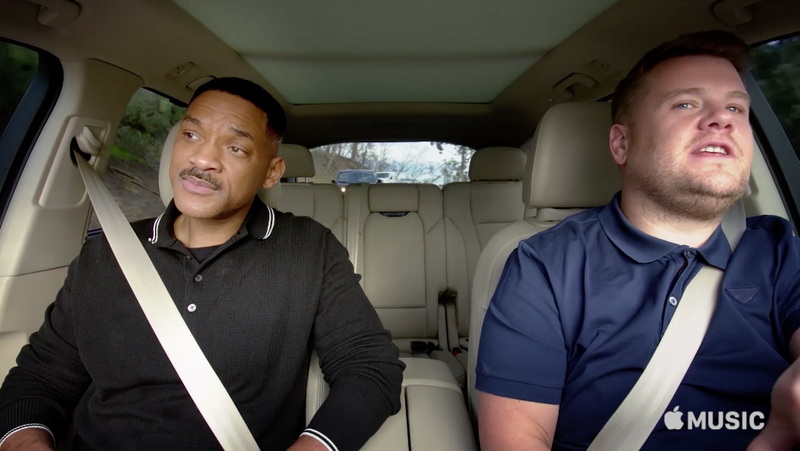 The series "Carpool Karaoke" made its debut on Apple Music with Will Smith and James Corden. The new series, which is an extended version of Corden's "Late Late Show" segment, kicked off with Smith and Corden rapping to "Gettin' Jiggy Wit It" before the two decided they needed a little more oomph to the song: Corden called on a marching band to accompany them in the car as they resumed the song. Corden then asked Smith how he began his career, and the rapper and actor revealed that he wrote his first rhyme at the age of 12, and released his first song when he was 16, "Girls Ain't Nothing But Trouble." Smith said of being in high school while launching his rap career, "I had a record on the radio for the last 30 days as a senior ... you cannot beat your friends in high school knowing you have a hit record on the radio." Watch Bruno Mars do "Carpool Karaoke"
Corden cracked, "Were you named 'Most likely to have already succeeded?'" The two also performed "Boom! Shake the Room" and talked about if Smith would play Barack Obama in a role. Corden also asked Smith to deliver his signature line, "Aw, hell naw." The rest of the "Carpool Karaoke" series will not be hosted by Corden. Instead, each episode will have a different celebrity "host" in the driver's seat with more time for interviews. These interviews will pair up stars like John Legend and Alicia Keys, and Seth MacFarlane with Ariana Grande. Check out the first six minutes of the first episode below. Beep beep! Watch the first six minutes of our premiere episode and then head over to applemusic.com/carpoolkaraoke for the full episode, available RIGHT NOW on Apple Music.